ATM security needs to stay ahead of crime. Challenged by elaborate fraud techniques and fierce attacks on ATMs, banks need to find the best security solutions to protect their business. Axis network video solutions provide the latest technologies and most adaptable products. Whether the ATM is deployed at a branch office, stand-alone, self-service kiosks or drive-thru, Axis addresses the needs for better security, lower costs and operational efficiency. One of the bigger challenges for ATM security is having usable video to identify criminals. With Axis megapixel or HDTV cameras, you can capture even the smallest details,making positive identification more accurate. With our Wide Dynamic Range functionality, Axis cameras are able to manage the challenging lighting conditions around ATMs. From bright sunlight, street illumination and reflections, our cameras provide the superb image quality you need. coverage of the ATM surrounding in a wide 16:9 format,while megapixel cameras can cover a large scene that would need several analog cameras. For covert surveillance you can opt for discreet cameras built-in to ATMs and use the unique Axis’ Corridor Format to get vertically-oriented video streams suitable for capturing “face-shots”. break-in alarms can be connected to the cameras I/O ports for alarm verification with video evidence in realtime. The purpose of an automatic gas suppression system is to provide 24/7 protection in the event of a fire. This is achieved by providing early warning fire detection which is designed to connect and activate the release of fixed storage fire suppression cylinders. However it should first be noted that in order for a system to function as intended the designer has to know the length,width and height of the protected risk. This is because automatic fire suppressions systems are calculated on the fixed volume of the protected area. 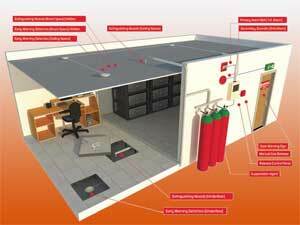 Some types of risks such as data centers have floor and ceiling spaces that must also be protected. A control measure to ensure the gas suppression is not released by accident such as an unwanted alarm caused by dust in the air, provision is made for a series of detector activations described as first and second (AKA double knock) stage alarms. The control panel requires two detectors in two separate detection circuits to activate before a gas pre-discharge sequence is initiated. The types of detectors used are normally smoke or heat detectors. Initially one detector will be triggered on zone one (first stage), if a second detector (second stage) is triggered then a countdown timer is started and once this time has elapsed, the gas will be released. During the above process a series of alarms will be triggered. During the first stage a sounder will be triggered, then during the second stage a different tone sounder will be activated. After the countdown timer has elapsed a bell and flashing strobe will trigger when the gas is released.The main control panel provides details and control of the current status of the system. In an emergency the gas can be released immediately by hitting a break glass call point or if you want to “hold off” the release process we can provide “hold off” buttons. Intelligent Video Analytics provides an advanced solution that performs intelligent video analysis and fully automates video monitoring. 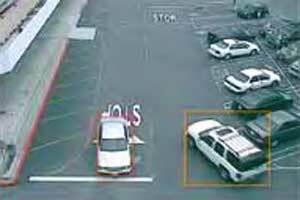 It automatically tracks and identifies objects, analyzes motion and extracts video intelligence from analog, digital, or IP video streams. 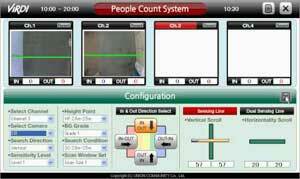 These analytics can output real-time events and object data for video data mining or storage in a database. Intelligent Video Analytics is focused on automating video analysis and security alerts, thus eliminating the need for manual work and the huge monitoring costs. 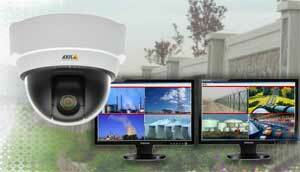 It also increases productivity and efficiency of video surveillance systems and the people who monitor them. Entertainment, casinos, retail stores, malls and shopping centres. With intelligent video analytics, the surveillance cameras that provide security also provide you with actionable intelligence about your business, big or small. 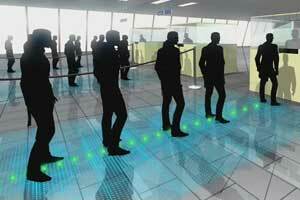 Panoptes can detect customers waiting too long in line and send email alerts directly to supervisors. With this information, the supervisor can send employees to aid with customers. Over time, this information can be collect to better allocate resources. products and the efficacy of various displays. Knowing customer flow patterns can allow for the optimal product placement, and generating this information in-house can allow for deeper floor setup testing. Information collected by enter/exit events provides insight to the store’s busiest hours and conversion rates. Crowds gathered outside the premises provide information about new signage or product displays. People lingering in front of displays show product engagement. Customers meandering around sales kiosks indicate customer confusion. Security cameras are everywhere these days. You pass them walking down the street, at the ATM, in nearly every store you walk into. But when it comes to bringing the technology into your home, the whole idea can easily end up in the too-hard basket. No more. Thanks to a hard push downwards into the consumer market, makers of networked home-security cameras now offer more, and easier, options for watching your house while you’re away. For a relatively modest outlay, you can get a basic networkable security camera with all the frills — motion detection, low-light operation — even Wi-Fi connectivity, so you don’t have to run cabling around your house. Pair it with an app on your smartphone, and you can keep tabs on your prize alpaca, look over your stash of gold bullion or make sure the ratty neighbours’ kids aren’t destroying your camellias again — whether you’re on the beach in Thailand or elbowing your way through a Moroccan souq. Many organizations provide canteen facility to its employees,but proper management of meals per employee is a cumbersome task. The software design provides a user friendly system that facilitates quick and efficient operation to cover larger section of employees for an organization. The software also provides paperless and cashless transaction solution and also has network based solutions to operate multiple counters simultaneously in a closed environment. 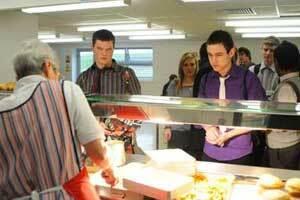 Can be integrated to Turnstiles/door access control system to control the access to the cafeteria/food serving area. 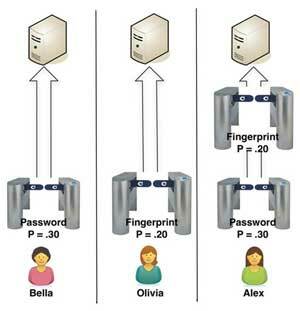 Identity management (ID management) is a broad administrative area that deals with identifying individuals in a system (such as Door Access Control System, Computer network, or an enterprise Application) and controlling their access to resources within that system by associating user rights and restrictions with the established identity. At the most basic level, identity management involves defining what users can do on the network with specific devices and under what circumstances. Today, many security products have an emphasis on managing mobile access to corporate systems. In an enterprise setting, identity management is used to increase security and productivity, while decreasing cost and redundant effort. 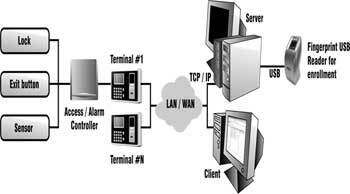 IP Surveillance software can be used with any type of Fire, Intrusion, Access Control and Alarm vendor. Instantly see what has caused the alarm; search the Events database for previous events together with instant live playback on preassigned cameras exactly when that event took place. Payroll clerks and managers have traditionally viewed the recording and verification of time worked as a constant source of errors. From the time an employee clocks in to the time the cheques are issued, the possibility of error mushrooms with every transaction that takes place. We are all familiar with the traditional time clock: – a device in which one inserts a time card and the current time is stamped on the card. The payroll process for most companies is as follows; at the end of the pay period the cards are collected and the hours worked for each day for each employee and manually calculated. Allowances are made for company policy in terms of early arrivals, late departures, differentials, exceptions and non-standard punches. It is readily apparent that each calculation performed and policy enforced leaves room for interpretation by the person performing the audit function. Supervisors audit the time cards, apply policy rules, add missed punches and sign off for payroll. Once the information has been signed off, the payroll department takes over. It is usually the case that payroll pays for the hours verified by the supervisor.